CT Man Rescued From Sea A Suspect? WTNH reports that the young man found alive after being lost at sea for 8 days was actually a suspect in the murder of his grandfather back in 2013. He was the last person to see his grandfather alive before he was shot dead. he as never charged. 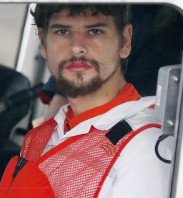 Nathan Carman was found alive after US Coast Guard called off the search after him and his mother went missing during a fishing trip. His mother has yet to be found. On Monday, investigators searched Carman’s home in Vermont, seizing a cable modem and a sim card, plus a letter allegedly written by Carman. There are conflicting reports of fishing locations and reports that Carman was attempting to alter and repair the boat.